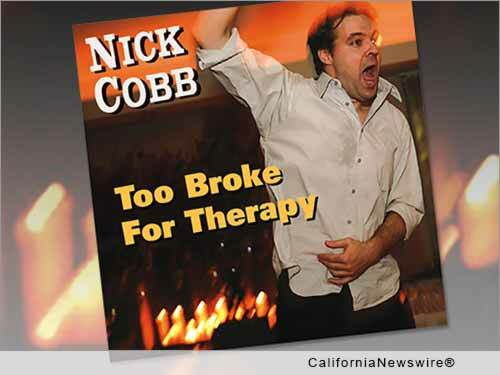 LOS ANGELES, Calif. /California Newswire/ — Uproar Entertainment is excited to announce the release of Nick Cobb's first comedy CD, "Too Broke For Therapy" to be released January 15, 2016. Uproar Entertainment is committed to recording and promoting today's most talented comedians. Touching on everything from the world's small daily annoyances to grander feelings about one's ever changing position in life, Cobb lulls his audience into his routine like a friend telling a casual story over beer and card games; only friendlier, funnier and with no inhibitions. "Too Broke For Therapy" was recorded at The Comedy Underground in Seattle, Wash. and is Cobb's first recording for Uproar Entertainment. Originally from Memphis, Tenn., Cobb's obsession over meaningless nonsense set the stage for him to embark on a whirlwind comedy career. While studying Psychology at Indiana University, Cobb took on a job at the aptly named comedy club, "The Looney Bin." However it wasn't until he won his first stand-up competition at a random Beale Street bar that he was bitten by the comedy bug and jumped at the chance to make the move to New York to chase his dream. While in New York, Cobb was featured on Comedy Central's "Live at Gotham," VH1's "Morning Buzz," MTV's "FN MTV," AXS's "Gotham Comedy Live," and AMC's "Date Night." His highly original material was featured in a montage as a semi-finalist on NBC's "Last Comic Standing." Now living in Los Angeles, Cobb had his late night debut on "The Late Late Show" with Craig Ferguson, recently co-starred in an episode of "Inside Amy Schumer," starred in Funny or Die's three-part series "Disney Couple's Therapy" and won the March Madness Competition at the Hollywood Improv. He also played the lead in a comedic web series for ESPN.com called "Team Players," and has been featured in commercials for Intel, Carmax, Pepsi Max, as well as an e*Trade spot during halftime of the Super Bowl.